Doctor Who: Stories From The Scrapheap - The Underworld | Warped Factor - Words in the Key of Geek. 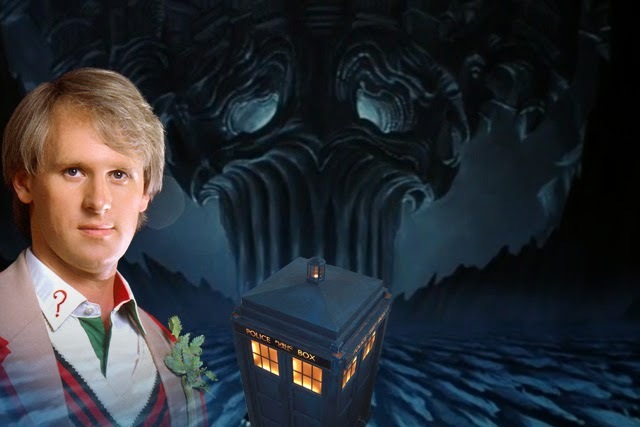 Prepare to learn more of Ancient Greece than you could ever possibly need to know as we head into The Underworld for our next Fifth Doctor Story From The Scrapheap, written by Barbara Clegg (who also penned The Rogue TARDIS for the older man looking younger than ever). As you may have guessed from the title, we're going to Hades..............sort of. If you know your classical civilisations well enough to score a nice double-hander safe in the knowledge that Hades was the name given to both the Greek idea of hell & the dark god who ruled it, well done. It would have taken on a third meaning had Clegg got her way and The Underworld taken pride of place in Season 21, Peter Davison's last in the role of the Doctor- the race he would have found himself up against being named as the Hadeans, who've been kidnapping the good ladies of Greece in a bid to solve fertility issues among the female population of their own kind. How've they been doing it? Convincing the menfolk of this particular corner of the ancient world that their lady friends are dead- rest assured, they're not! Instead they've been drugged, and medicine man Herm ( yes, the name is indeed adapted from that of Hermes, a Greek god) is working with the Hadeans to ensure them a steady stream of maidens by encouraging the male relatives of the ' dead' to send them off on a journey down the river Styx. "Several elements of the storyline were inspired by Greek mythology. The Hadeans were a reference to Hades, the name of both the Greek Underworld and the god who ruled it. Styx was the river which formed the boundary between Earth and Hades. Orfeo and Erdiss were analogues for Orpheus and Eurydice; in legend, Eurydice dies of a snakebite, and her husband Orpheus travels to Hades to bring her back (albeit unsuccessfully). Herm's name was derived from the god Hermes, one of whose roles was to guide lost souls to Hades. Charon, the ferryman who transports the newly dead across the Styx, became the bargeman Kairon, an accomplice of Herm." And what's the primary cause of ''death'' here? Snakebites, though the Mara is nowhere to be found. What of the mythological river down which the Doctor must surely have been intended to sail? The Dictionary of Greek and Roman Biography and Mythology can help us there. "STYX, connected with the verb stugeô, to hate or abhor, is the name of the principal river in the netherworld, around which it flows seven times. Styx is described as a daughter of Oceanus and Tethys and as a nymph she dwelt at the entrance of Hades, in a lofty grotto which was supported by silver columns. As a river Styx is described as a branch of Oceanus, flowing from its tenth source (789), and the river Cocytus again is a branch of the Styx. By Pallas Styx became the mother of Zelus (zeal), Nice (victory), Bia (strength), and Cratos (power). She was the first of all the immortals that took her children to Zeus, to assist him against the Titans; and, in return for this, her children were allowed for ever to live with Zeus, and Styx herself became the divinity by whom the most solemn oaths were sworn. When one of the gods was to take an oath by Styx, Iris fetched a cup full of water from the Styx, and the god, while taking the oath, poured out the water." So the river was in fact named after one of the pantheon of Greek goddesses, though this one was more of a demon, named as the embodiment of hatred- or stygos in Ancient Greek! The Doctor has of course experienced divinities of sorts in not one but two Atlantises. Yes, you did read that right! One features in The Underwater Menace, its inhabitants worshipping Amdo & its priests quite ready to sacrifice the Second Doctor, Ben & Polly to her, while a somewhat more correct, at least going by the many myths & legends surrounding it, version is the setting for The Time Monster as Kronos threatens to run amok following the Master's meddling, with a little help from the priest Krasis. Perhaps as an alternative following the scrapping of The Underworld, Ms Clegg had a go at something a little different but also intended for Season 21. Her plan was to examine the radical question of what would happen were Time Lords able to merge with their TARDISes! Step inside The Rogue TARDIS. "Locating Ajon's TARDIS, the Doctor discovers it transformed into a nightmare world where cause follows effect. Eventually, it emerges that Ajon is half-human and, in response to the suppression of his human characteristics, has regenerated into a computer which is corrupting his TARDIS. The Doctor induces Ajon to regenerate again, ending the terror." It wasn't entirely hard luck for Barbara when it came to writing for Doctor Who. Enlightenment from Season 20 is her work, the tale of a yacht race like no other as well as a return for the White & Black Guardians for the first time since the Key To Time arc, back when the Doctor preferred jelly babies to cricket. DOCTOR: Surely, surely you must find it rather strange that none of you can recall signing on? COLLIER: Oh, we remember that all right. JACKSON: Oh yeah, I mean, we signed on aboard, didn't we, lads? COLLIER: Yeah. And we got a month's wages in advance. Not likely to forget that, now, would we? JACKSON: Now that's one thing I'll say for the Captain. I mean, he certainly ain't mean. COLLIER: Yeah, but he stands to make a packet, I dare say, if we win. JACKSON: The race, lad. The race. And the prize? Enlightenment itself!